Leaves skin firmer, elastic and smooth. DESCRIPTION: Silhouette Xpert Regenerating & Firming Cream from Sensilis is a nutritious body cream formulated with active ingredients of natural origin selected for its high moisturizing, firming and regenerating effectiveness, to achieve firmer, elastic and smooth skin. 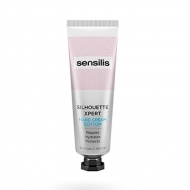 Its refreshing texture fuses with the skin and is absorbed quickly, leaving a smooth, uniform and luminous finish. Suitable for all skin types, including the most sensitive. Apply 1-2 times a day on body.